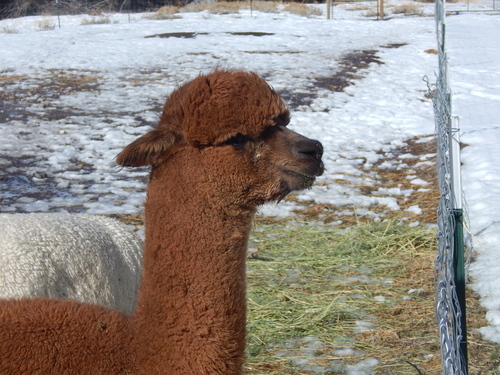 Rainman is the product of the VERY finest-fleeced Hemingway dam Bobbie Ann and Accoyo El Nino, whose density and fleece character are legendary. Rainman is the merger of A and B lines and has enough offspring to bear testament to his consistent impact with improved density, crimp, fineness, and coverage. Danielle is a sweet-natured female with a beautiful, calm presence. She retains her outstanding fleece quality as evidenced by her histograms. Baby alpaca grade at 2017 shearing. 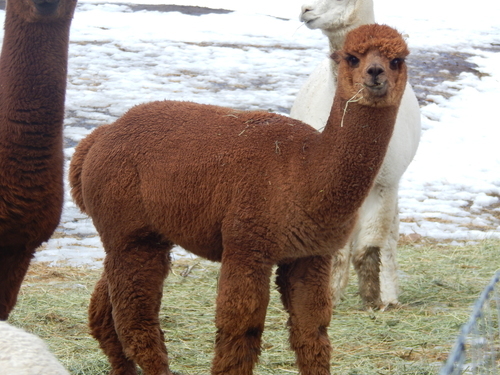 Covered from head to toe with gorgeous dense, crimpy light-fawn fleece, this girl definitely got the best from each of her parents, Velvet’s Accoyo Alexander the Great and Julius Caesar’s Angie, and passes these characteristics to her offspring. Golden Pine's Jackson is a solidly built male with great herdsire potential. 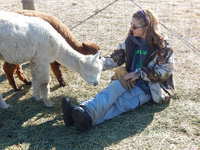 He exhibits uniform fleece quality, perfect conformation, an easy going temperament, a beautiful head and correct bite. Covered from head to toe in bright, soft, long-stapled fiber, he shears a consistent 5 inch staple length. Take a look at the sire and dam of Jackson. Rainman retains a baby grade AFD at age 11: Guard hair is almost non-existent. Golden Pine's Danielle consistently averages 21.3 microns over 8 histograms records. Temperaments of both Rainman and Danielle are calm and mellow and Jackson has inherited both of these traits from his parents.